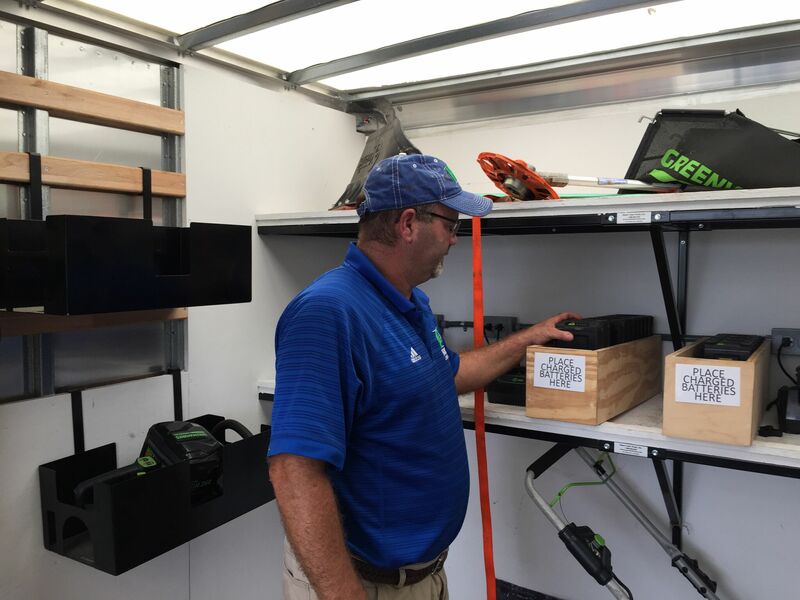 Thanks to the on-board, all-day charging capability of the Solar Lawn Truck, Scott Hord says his crew has never been caught off-guard without enough charged batteries. Hord Landscaping & Lawn Care is seeing several advantages to operating battery-powered lawn equipment thanks to the efficient on-board charging capabilities of the new Solar Lawn Truck. Scott Hord officially started his company, Hord Landscaping & Lawn Care in Campbellsville, Kentucky, in 1994 after graduating from college with a degree in horticulture. He had been mowing lawns long before that, though, getting his start as a teenager before he even had his driver’s license. With 30-plus years of operating traditional engine-powered lawn equipment under his belt, Hord has spent his fair share of hard-earned dollars on gasoline. Nowadays, he is spending a lot less. In May 2018, one of Hord’s lawn maintenance crews began operating out of a brand new innovation for the green industry. The Solar Lawn Truck offers the same productivity-enhancing features as the truck it was patterned after, the Super Lawn Truck. In addition, the Solar Lawn Truck comes equipped with essential lawn maintenance equipment that runs on battery power, as well as everything needed to keep the lithium ion batteries charged all day long in the field. The Solar Lawn Truck itself runs on gasoline. However, its cutting-edge setup is helping Hord save a lot of time and money when it comes to fueling a long list of everyday lawn equipment. The truck is also giving him a strong competitive advantage with a variety of residential and commercial clients. Hord Landscaping & Lawn Care offers a variety of services including residential and commercial maintenance, lawn care, lighting, hardscaping, irrigation, and athletic field installation and maintenance. Roughly 23 employees work on several different crews across these service departments. Hord says the reduction in fuel consumption by his Solar Lawn Truck maintenance crew became obvious almost immediately. He is also spending considerably less on engine oil. Scott Hord with his new Solar Lawn Truck. According to Super Lawn Trucks field data, a gas-powered backpack blower operating for an average of 500 hours will use approximately $1,125 in fuel each year. A battery-powered backpack blower uses just $40 of electricity for 500 hours of use. As a landscape contractor broadens his or her use of battery-powered equipment, the fuel and cost savings start to add up quickly—just as they have for Hord. His Solar Lawn Truck crew is now operating everything from battery-powered push mowers and string trimmers to leaf blowers and chainsaws. Greenworks has partnered with Super Lawn Trucks to provide the commercial-quality, 82-volt battery-powered equipment. The Solar Lawn Truck makes it very easy to keep batteries charged all day long in the field. The truck functions similarly to a solar-powered home. Solar panels on the roof of the Solar Lawn Truck’s integrated, enclosed trailer convert sun rays into electricity. That electricity is used to charge the lithium ion batteries right inside the trailer. Hord says his crew has never been caught off-guard without enough fully charged batteries. Every night he places all eight batteries on the charging station in the Solar Lawn Truck. Then, during the day when the crew is working, some batteries are recharging while the others are powering equipment. Hord had operated battery-powered equipment in the past. In order to get through a full day’s work, he typically had to opt for a larger backpack battery. It provided the necessary power and runtime, but was not easy on the operator. In addition to ease of use and fuel/oil savings, Hord says there are also performance gains to be made by switching to battery-powered equipment. The same can be said about the Greenworks battery-powered chainsaw and/or pole saw. The Greenworks push mower, hedge trimmer and debris blowers are always up to the task. For the majority of the work done on weekly maintenance accounts, the Greenworks equipment has proved to be up to the task. 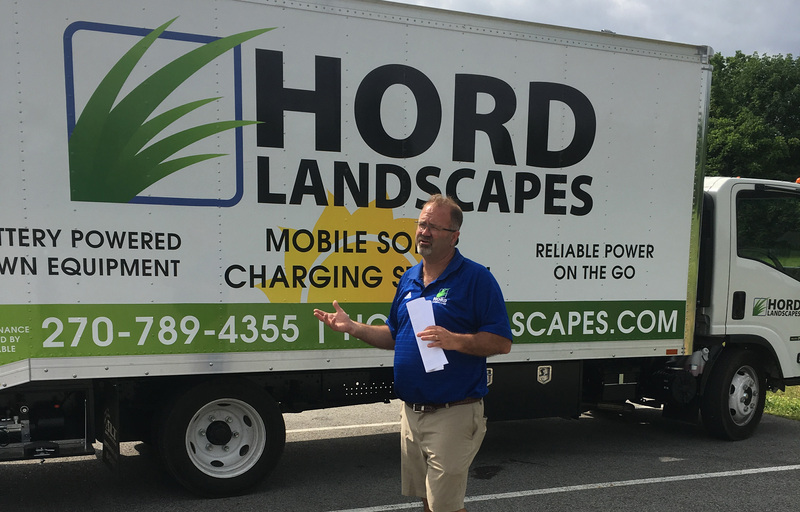 Hord says his crew’s use of the Solar Lawn Truck and its battery-powered equipment is something he is emphasizing when talking with both existing and prospective clients. “Everybody wants to go green these days,” he says. “We’re reducing our use of fossil fuel as well as our carbon emissions. We’re reducing the amount of noise we create on jobsites. That’s a good thing. We’ve been testing this for several months now during our busiest time of the year. Hord had actually operated Stihl battery-powered handheld equipment in the past. He liked it, but wanted something a little more lightweight. He also wanted a more efficient way to put this technology into the field. 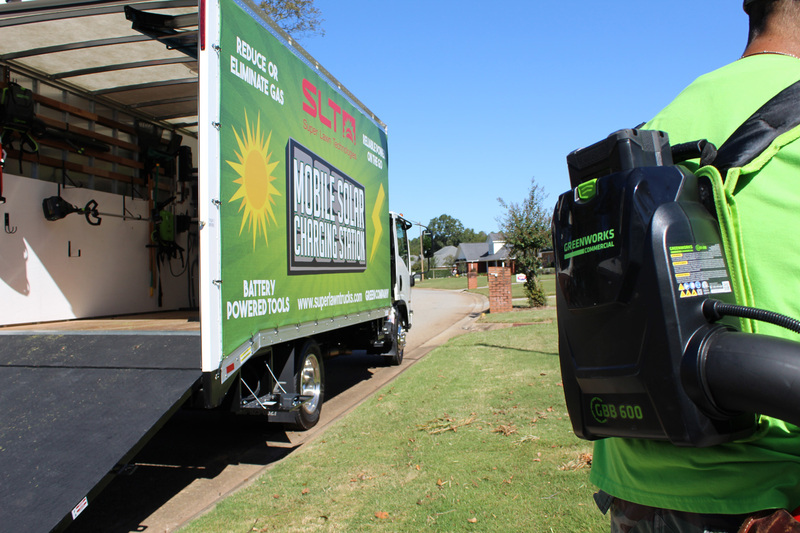 For more information on how the Solar Lawn Truck can help your landscape company become part of the lithium ion landscaping revolution, visit Solar Lawn Truck. EDITOR’S NOTE: Since this interview was conducted, Greenworks has released a 48-inch stand-on mower and 60-inch zero-turn riding mower – all powered by 82-volt lithium ion battery technology. Super Lawn Technologies is currently field testing these mowers with competitive brands to determine best-use scenarios. Stay tuned to this story as the results come in.